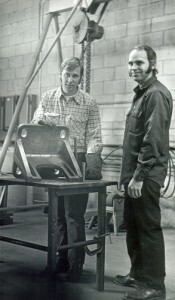 Two men named Dan Tuthill and Richard Schenk founded Danrich Welding Co. in 1970. Both brought with them numerous years of fabrication experience and education in the metals industry. Dan was the plant manager of a large fabrication shop and Richard worked in the office in charge of estimating and purchasing. With these combined skills the opportunity for a successful new business was at hand. The business was started after many months of research and agonizing about what the business model was to be. With limited resources, the business started out as a Job Shop welding and fabrication shop. In just a few years the owners decided to add a sheet metal shearing, punching, and forming department. With this addition, we were able to provide our customers an opportunity to simplify their purchasing process. As the business continued to grow, Danrich pursued new ways to meet the customer’s needs. In the year 2000, we purchased a 3000-watt Trumph laser-cutting machine to be able to process the intricate cut details that are now being demanded by the industry. In 2007 we wanted to offer more cost-effective alternatives to our customers manufacturing needs without sacrificing quality; therefore, Danrich made a new acquisition, a Panasonic Robotics MiG welding machine. Decreasing lead-times and increasing volume this MiG Robotic Welder proved to perform precisely to our customers desires encouraging us to add to our arsenal by purchasing a larger, more capable Panasonic Robotics TiG welding machine in 2009. As with any business, just having the right equipment to do the job doesn’t equate to providing a quality product. Over the years we have hired quality people, many of whom have been with the company 25 plus years, to provide a quality product with an emphasis in partnering with our customers to meet their needs. Danrich has been able to continuously grow thanks to the relationships with our customers and our highly Valued Staff.